028: How to determine the functional currency when a company deals with more currencies? IFRS Question 028: How to determine the functional currency? I have a query related to determining the “functional currency”. The standard IAS 21 does not have a lot of examples or details on determining the functional currency where there are various currencies involved in the entity’ economic environment. E.g. Co is registered in India, however 80% of sales are in EUR, it buys raw materials in USD, labour costs are in INR. Generally any loans are in INR…. how would we decide functional currency in this instance? IAs 21 says that the functional currency is the currency of the primary economic environment in which the entity operates. In most cases, it is crystal clear. Normally, it’s the currency in which the company makes and spends money. And, in most cases it will be just the currency of the country where you operate. But, not in all cases. One good example are factories owned by Western countries, operating in low labor cost countries like India, Cambodia or so – such a subsidiary in India makes sales mostly in Western currency, like USD. People are paid in INR, but the materials are again purchased in USD. In this case, the functional currency is USD despite the fact that the subsidiary is incorporated in India. To help you with the determination, IAS 21 lists some indicators to consider when determining your functional currency. If it is still not obvious from those indicators, then the management must use its judgment to determine the functional currency. Well, I would say that there is a certain hierarchy of the indicators to consider. So, not all indicators are equally important and you should give priority to some of them and only then consider the others. The currency of your cost of sales and other expenses. The currency of your sales is probably the most important. Which currency mainly influences sales prices for your goods or services? Secondly, what country (if any) and its market or regulations or other forces determine your sales prices? Let’s say that you are a holding in Europe and you set up a subsidiary in India. The subsidiary makes 80% of sales in EUR and the remaining 20% are in INR for domestic Indian market, but the prices in INR are updated monthly based on the foreign exchange rate EUR/INR. In this case, well, the functional currency is EUR, because 100% of sales are either denominated or affected by EUR. The currency of your cost of sales. The second primary factor is cost of sales – I mean cost of materials, labor, services that you purchase, utilities, etc. Special For You! 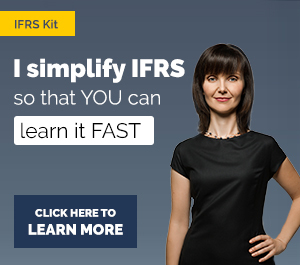 Have you already checked out the IFRS Kit ? It’s a full IFRS learning package with more than 40 hours of private video tutorials, more than 140 IFRS case studies solved in Excel, more than 180 pages of handouts and many bonuses included. 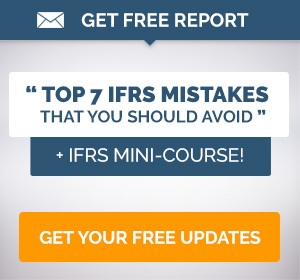 If you take action today and subscribe to the IFRS Kit, you’ll get it at discount! Click here to check it out! The standard IAS 21 puts sales and cost of sales to one level. In other words it says that these 2 factors are primary and equally important. So, if in the above example, the costs of Indian company are denominated mostly in EUR, then the functional currency is for sure EUR. Let’s say that the same Indian company pays its employees in Indian rupees, but purchases materials in EUR. In this case, I would say that again, the functional currency is EUR, because the sales are denominated in EUR, and significant portion of costs is denominated in EUR, too. What happens if this Indian company is financed by the loan denominated in USD? The functional currency is still EUR, because you made your conclusion based on the assessment of the first 2 primary factors – sales and cost of sales, so you do NOT take the other things into account. But what happens when it is not possible to determine the functional currency from the first 2 primary factors? What happens when the sales are in EUR and expenses are in USD and INR? Funding: What is the currency of financing, like debt or equity instruments? Cash flows: In what currency does the company retains cash received from operating activities? When your company is a subsidiary of a foreign parent, we must take that into account, too. What’s the degree of autonomy of the subsidiary? Is the subsidiary acting independently? Or, is the subsidiary totally dependent on the parent? Let’s take our Indian company again. Let’s say that it makes 100% sales in EUR and it incurs 100% of expenses in INR. So it’s not possible to say from first 2 primary factors what’s the functional currency. We have to ask – in what currency did the company receive its financing? If it’s in EUR, then yes, maybe it’s OK to conclude that the functional currency is EUR. If it’s in USD, it does not help that much, because it’s the third currency in a game. What’s the relationship between the Indian company and its European parent? How does the Indian company operate? If it produces some goods based on parent’s instructions, purchases materials from parent’s suppliers and sells 80% to the parent, then there’s almost no autonomy and it’s likely that the functional currency will be the same as that of a parent. However, if the Indian company incurs its own expenses and makes own sales, and the transactions with the parent are in relatively low proportion, then the functional currency is not necessarily that of a parent. As you can see, in some situations it might be very challenging to determine your functional currency and you have to use a lot of judgments and assessments. I can’t give you the outright definite answer as I don’t know all the facts surrounding your own situation. Also, last but very important: I strongly recommend keeping the appropriate documentation to support your conclusion, especially in these foggy situations. Well, the reason is that your auditors might have another opinion and judgment, so you should be able to support your own. Any comments or questions? Please add them below – thank you! We are a flight operations management company and we operate world wide, we invoice our clients in both USD and in Euro and same currencies form our cost of sales but all our expenses are generally made in the Ghana cedi except bank charges. All vendor payments are also made in foreign currency with bank charges also in the respective currency of our funds transfer. For a particular month, we may have 60% of sales in USD and 40% in Euros, and in another month we may have 30% of sales in USD and 70% in Euros and it keeps changing month by month. In this case, which currency should be our functional currency even though our financial statements are presented in Ghana cedi and that is our presentation currency. We are not a subsidiary of any foreign company but an independent one incorporated in Ghana. It is just one example of the assessment you need to make and sometimes, it is not an easy process. Good luck! Thank you for the article and also for the motivational quote. I bought equipment in EUR and my currency USD I paid prepayment and I had loss from exchange rate . 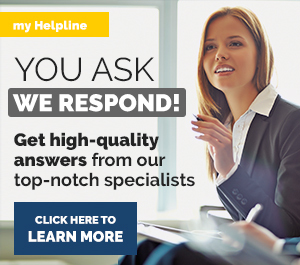 Hi Mohamed, you can learn about acquiring PPE in foreign currency and prepayments here, you will find the full answer. Copyright © 2009-2019 Simlogic, s.r.o. All Rights Reserved. under licence during the term and subject to the conditions contained therein.